Helen bless youtube spelunking. 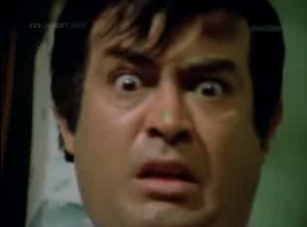 While looking for Rekha cabaret songs, I happened across a number from Chehre Pe Chehra. Upon closer inspection, the film turned up billed as "based on Dr. Jekyll and Mr. Hyde"...and sold! Perfect for Halloween! I haven't read the original but the whole concept seems like it could make a delightful Bolly-style project - you are your own evil masala villain or long-lost badly-behaved brother! Indie Quill graciously watched this with me and filled me in on what was going on since my version was unsubtitled. 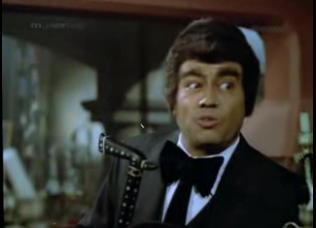 That plus not having read the original means I probably missed some things, but I still enjoyed Sanjeev Kumar's ACT!ING! 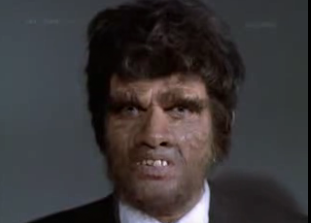 (term courtesy of Indie Quill) and makeup in his Mr. Hyde freakouts. In reading up on the original source material, I realized that the story is so ingrained in mainstream western culture that we have forgotten that some of the glee of the original story is that it is a mystery - no one knows who this horrible Mr. Hyde is. For us, the appeal is more in watching the dual natures of this person duke it out for control. and then tests it out on himself with the expected fantastic results. 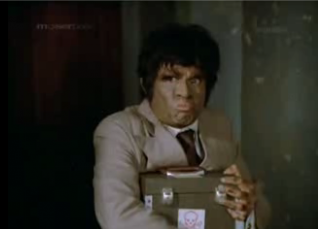 Mr. Blackstone - whom IQ and I both thought was called "Black Stew" at first, such is Sanjeev's enthusiastic but weird pronunciation - initially appears just to be a slightly uglier, wilder version of Wilson, including green fingernails, a pompadour, and a curious fashion sense. I read that in Dr. Jekyll and Mr. Hyde, a cane is an important clue to Hyde's identity, so I'm going to credit this accessory as being a clever nod. "Why are you wearing a cape, Diana?" "Sigh. Everything else was at the drycleaner." perhaps because he knows that Wilson isn't a good catch for his daughter. One night Wilson runs into dancer (and prostitute?) Daisy (Rekha), who convinces him to come back to her house to treat a bruise she has received at the hands of someone who doesn't approve of her line of work. He follows her to her bedroom, where she neatly de-robes from her dancing outfit and slips under the covers...and they smooch! I couldn't believe it! He proceeds to give David some line about how he shouldn't refuse if his patients feel better in his presence, to which David replies "Come on, shut up, yaar." At the end of the film, it seems that the whole town is sad about what Wilson has done to himself, but I have no idea why. He doesn't seem exceptionally likable to me - and more importantly, it doesn't seem like his bad sides were ever all that deeply buried or under control. Wilson is a lot more id than your average film hero. The rest of the story unfolds as we know it will. Wilson tries to balance his time as Blackstone but the evil gains more and more power. The makeup and wardrobe crew deserve lots of points for how well they physically depict Blackstone's increasing badness - he gets uglier and wilder by the day. Contrast this version of Blackstone with the one above with the cane: the hair is bigger, the eyebrows shaggier, the teeth more raggedy and fang-like, the skin greener and more mottled. 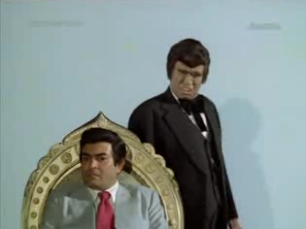 Sanjeev ups the deep, raspy voice as his monstrosity increases, and when he isn't ACT!ING! it's a fairly effective, if silly, performance. 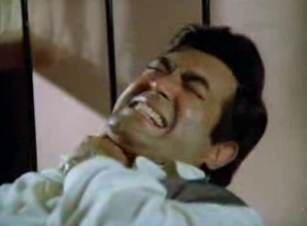 I know I'm being a little hard on Sanjeev, but this is not the first time I've seen him chomp on the scenery. Maybe it's a horror movie thing - he's ridiculous in Jaani Dushman and this performance reminded me very much of that one. Of course, it's probably hard to refrain from histrionics when you have to punch strangle yourself in a good-vs-evil, man-vs-self smackdown (starting at about 6:25 here). Actually, I should be grateful for his hamminess. Chehre Pe Chehra offers several top-notch freakouts just ripe for dramatics, and, along with Rekha's saucy dancing, they're the best part of the film. 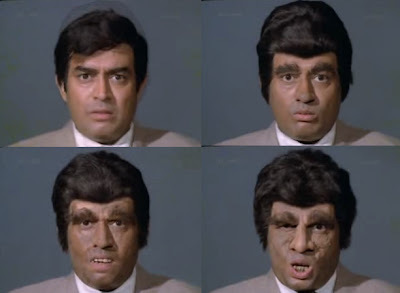 If Sanjeev and the makeup people hadn't gone overboard, this movie wouldn't be half as good. and gets raped by a monster doesn't make it out of the film. Blackstone is just as fond of Daisy as Wilson was, and her cabaret is the first place he goes when he transforms. Daisy, wisely, is horrified and seeks help from her friend Dr. Wilson. Hindi Movie Irony Bell goes CLANG! Poor Daisy also has romantic intentions towards Dr. Wilson, but unfortunately confiding in him seems to threaten Blackstone enough that he cannot let her live. As for Wilson's socially acceptable romance, Diana doesn't do much other than cry and shriek. He all but abandons her during all his cavorting as Blackstone. After realizing that violence, blood, and lusty situations set off his transformation into Blackstone, he eventually tries to seek a cure in her good and innocent presence. We know how that will go. The mystery aspect is handled by Wilson's friends David, Dr. Sinha (Shatrughan Sinha), and Cardoz (?) 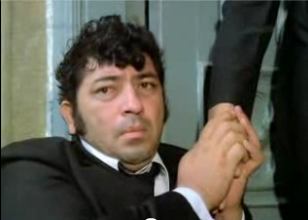 (Amjad Khan), who even bring in the cops to help figure out who killed Daisy and another, far more innocent victim. 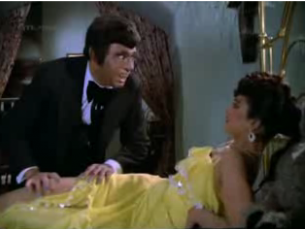 Shatrughan is totally wasted - he doesn't get to dishoom or sass or hit on anyone. Amjad is really endearing - I know! - as a cuddly, pitiable blind patient of Wilson's who becomes bonded to Blackstone by a tragic event of the type that makes you scream "That is a stupid-arse idea, Amjad!" at the screen. 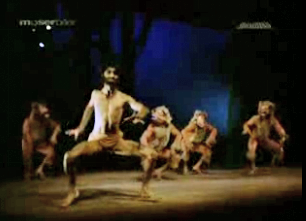 I liked Chehre Pe Chehra. 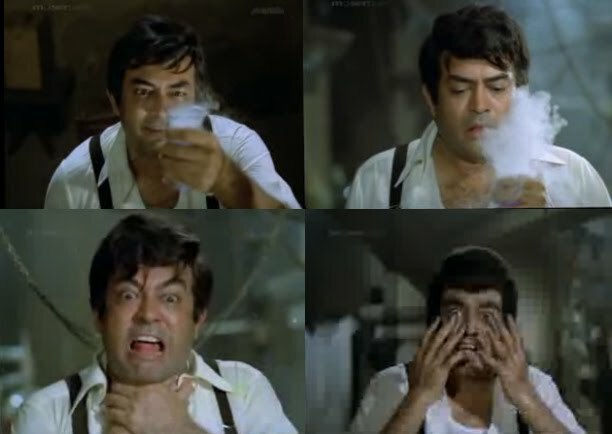 Despite all the different people in it, most of its energy is spent on Sanjeev's various performances. This might keep things from getting too crazy but it also made it less relatable than it could have been - providing Wilson with a family context would have given him an emotional depth that the lone scientist lacked and warmed up his descent and eventual loss. As is, the ending felt chilly, a church full of people trying to get me to mourn the demise of someone who long ago proved himself a less than ideal individual and community member. Curiously, the conventions and constrictions of Victorian England in the original are not conspicuously drawn on or played off of in this transplant, and I'm kind of surprised there wasn't an overbearing mother who tried to mold Jekyll into a marriage he didn't want or a wife who nagged him about duties to home and hearth, just to give his Hyde qualities something to rejoice in abandoning. Those omissions probably saved the film from going overboard, and, except for the solitude of Wilson, the resulting project is generally satisfying in how it meets most of the marks you'd expect of a masala take on the idea of "the villain within." The screen captures I've included so far do not give you any idea of what's worth looking at in this film other than the monster makeup, so here are a few to round out the sample. Rekha shows a lot of skin in this film, and she does a great job making Daisy into a carefree woman who has no idea what fate awaits her. Smoking, flirting, showing skin = dead. Both of her songs were fun and Helen-y; the music by N. Dutta was fine, but I like his work in Holiday in Bombay much better. In this particular phase of monster development, Sanjeev reminded me so much of Dilip Kumar. Don't ask me to explain, but IQ saw it too. Here he clutches his helpfully labeled potion kit. 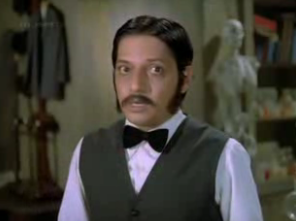 Amol Palekar appears as Peter, Wilson's servant. He, like whoever picked out Blackstone's first outfit, thinks we are in the late 1800s. 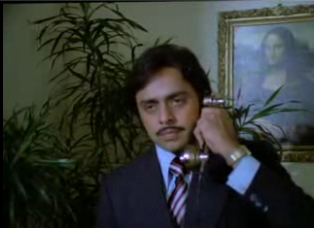 I love this picture of Vinod Mehra because he looks so bored, perfectly mirroring how I felt whenever I saw him. Plus he has a Mona Lisa in his house! We get a logical conclusion of trying to catch a fugitive with guns in a chemistry lab. 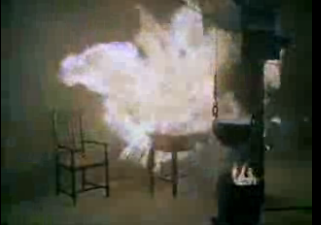 Note the hanging iron cauldron! Before their wedding, Diana and Wilson go to a ballet about a wolf boy...that she narrates (see part of it at the start of this clip). Ha ha a Hindi Dr Jekyll and Mr Hyde!! HAve to look out for this one! hee hee! This was definitely one of our better ideas, Bethy Beth! 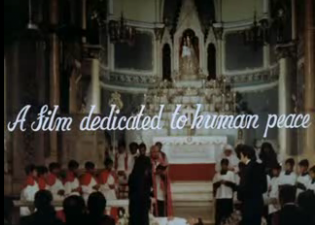 You forgot to mention Vinod Mehra shows up in a baby blue long coat of the kind Dickensian heroes wore that he paired with a baby pink shirt and power tie with grey stripes. Very fetching. It's a terrible movie but entertainingly so! 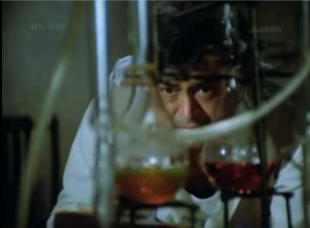 One of the better Hindi film adaptations of Jekyll & Hyde IMO was the Ramsay venture Dahshat, where Om Shivpuri plays a brilliant doctor of questionable ethics who devises a serum that will allow humans to have the heightened senses of animals. Check it out, you might like it. I know Sanjeev is touted as the second coming of the Acting God (after Dilip Kumar) but I've seen him chew up quite a lot of scenery too :) If you enjoyed watching him in different characters and you haven't seen it yet, try Naya Din Nai Raat--he plays nine different people, and it's a pretty entertaining film. My head is spinning!! This looks like the perfect Halloween movie, especially with all the beautiful ACT!NG! Dr. Jekyll and Mr. Hyde was made for masala! This is one of my fav crappy-movie-with-cool-ppl! Im so so glad u watched it :) it loved the surreal maddness of it all, esp Rekha and Amol's characters. 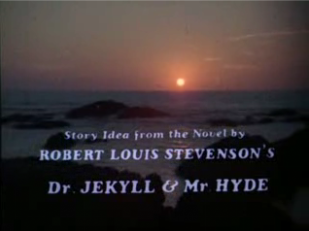 If only human peace could be solved with a little Hyde & Jekyllery--ah, what a wonderful world it would be. 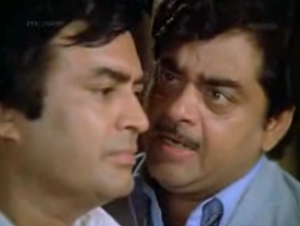 :) I must watch this, though Sanjeev Kumar is not my favourite actor. I never understood why everyone raved about him. As for the family angle, you know, being single and without family in India, could mean 'psychological trouble' the way having a nagging mother or wife could mean that in the West.